Disclaimer: I was provided with products in return for my honest opinions. Your views may differ from mine. Thank you! 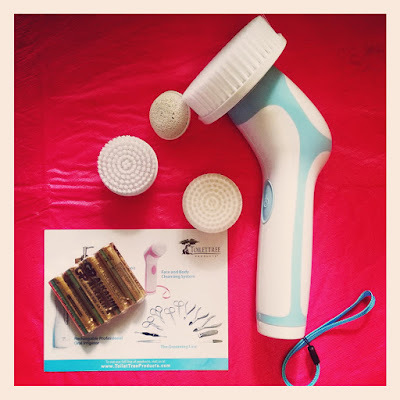 This is a facial brush skin cleansing system, from ToiletTree Products, which comes with 2 facial brushes, a body brush and a pummice stone - it also comes with batteries, so there is no need to purchase them separately, either, which is a huge bonus! The brush system is easy to set up - you just pick the brush you want to use, attach it and make sure you've put in the batteries and you are ready to go. I recently started to get really fine lines and wrinkles and decided to step up my game when it comes to my skin. I don't wear make-up too often and I don't put too much on my skin in general, but I do like the feeling of a freshly scrubbed face, which is essentially what this brush does on a deeper level than just with a regular flannel. I like to use face scrubs and masks but this eliminates the need for all of that, overall. Just pick your favorite facial cleanser and pick your brush from one of 2 (soft and medium) brushes and apply gently to your face as instructed. Use the bigger brush for all over body cleansing and the pumice for your feet and you have a total body cleanse, too! The Cleanser stimulates skin renewal, makes skin feel smooth and deep cleans! When using moisturisers and a good regimen you can improve your overall appearance with regular use! Available in several colors, this would make a great Christmas gift for anyone! Find them online, HERE and pop one under your tree! You can also follow them on Facebook and Twitter, too! Follow Mom's Gone Bronson's Holiday Gift Guide with #MGBHGG and at the tab, above!